If Professional Fitness And Nutrition Experts REFUSE To Waste Time Agonizing Over Endless Workout Sessions And Demanding Eating Plans, Then Why Should YOU? Re: How To Recognize Whether Your Current Health And Well-Being Strategies Are Pure Time Wasters! Your health and wellness are such valuable commodities that any amount of time you apply towards improving them is surely worth the effort. Right? Or is that just plain WRONG? What if I told you that MOST people today who exercise regularly, and who make conscious choices about the quality of the food they eat, are not getting anywhere near the degree of benefits from their actions that they could be getting? Is This Anything Like YOUR Life? You have tried several diets over the years (maybe even dozens) and yet none of them provided the long-lasting effects you had hoped for. You have taken up regular exercising only to discover that it doesn't seem to have had any real effect on improving the shape of your body. You simply do not have the time or energy to keep on trying NEW approaches to eating and working out in the hope that one of them will finally show some promise. Don't be at all surprised if you find yourself agreeing with MOST of the statements above. That is absolutely normal. In fact, the number of people who ARE able to derive the kinds of benefits from their exercise and nutrition programs that they hoped they would be able to derive is actually depressingly small. I say depressingly because today I am a health and fitness professional whose job it is to help get my clients on the right track, and I know from experience that success does not come easy! Even WITH a trained guide at your side. It may seem odd for me to admit this, since I count myself among the group, but this problem is largely the fault of the health and wellness industry. This is because we have concocted one "promising" scheme after another in the hope that something would catch on and reverse the slowly declining health of the general population. Every time we come up with a new approach it broadens the total universe of possible approaches to getting into shape and only serves to increasingly confuse the intended audience. I know this because once upon a time I was that audience! I remember having an almost Pavlovian response to newly released diets and exercise fads. I wanted to try them all! Not only was this physically taxing, it was mentally exhausting too. This was back in the eighties when aerobics classes and cardio were all the rage and promised to transform the bodies of the nation. In fact I was so convinced that cardio would do for my body what dieting alone had failed so miserably at that I became a JAZZERCISE JUNKIE and eventually even a class instructor. As it later turned out, I had bought into the ridiculous promises of being able to achieve a lean and energetic body with cardio alone. What did I get in return for dedicating myself to a life of cardio? I got fatter. Almost 10 years into this jazzercise excursion of mine it finally dawned on me that both myself AND the class I was taking were getting nowhere as the years rolled on, if not just a little plumper with each passing summer. This proved to be one of the biggest lessons of my life. I had finally learned that exercise, in and of itself, was NOT the answer. You can go through the motions. But if you are doing the wrong thing, you will go NOWHERE. Nor did dieting improve things any for me. I had starved myself on and off during this time period and all it did was leave me feeling emaciated. Before long I had discovered a whole new approach to getting from exercise exactly what I had always believed should be possible but which until that time I never knew how to pull off. The BREAKTHROUGH came when I learned how to exclude activities and eating plans that were heavy in mental and physical investment but were NOT paying off in terms of tangible results. I learned how to maximize both the efficiency and the effectiveness of the things I was doing in the gym and in my kitchen. It was a watershed experience for me and absolutely changed both my life AND my body. More than 30 years later I have distilled these ideas and put them down in writing. Listen, I would love to be able to take credit for the ideas you'll find in The Minimalist Exercise Program. Because the principles I teach today can be absolutely life-changing. Especially for people who are committed to taking the necessary steps to dramatically improve their health. But I cannot take the credit for the philosophy outlined in the book because everything I know today was the result of the hard work of others. It represents the accumulated wisdom of both men and women who dedicated their lives to improving their health by focusing solely on the problem of how to seriouly resculpt their bodies. It was the sport of bodybuilding that had replaced my former love of jazzercise. But unlike the unrewarding cardio sessions that dragged on for years I saw almost instant changes in my body when I took up strength training as my foundational physical activity and began to copy what others were doing in the gym with free weights. These were people whose passion to transform their bodies conflicted with the reality of having to pay their rent and put a LOT of food on their table. They had the voracious appetite of people for whom muscle growth meant having to eat two or three times as much as the average person! My new friends LITERALLY could not afford to spend hours in the gym every day. The ones who were unable to figure out how to train both effectively and efficiently in the little time they could squeeze in at the gym? Well, they soon vanished from the squat racks and the bench press areas of our gym. If any environment can be said to be representative of Charles Darwin's theme of "survival of the fitness" it is a bodybuilding gym! I have seen proof of the value of these lessons time and time again. This is because - as the owner of a gym - I see thousands of people stream through my premises every year. Sadly, not all of them use their newfound time in the gym to very much improve the status of either their health or their fitness. The small group that do see significant gains are invariably the men and women who - through personal instruction, or some divine intuition - end up doing almost exactly the things outlined in the pages of The Minimalist Exercise Program. I am talking about the benefits of exercise (as fully discussed in the book) that are gained with the minimalist approach. What kind of benefits, you ask? How to get the MAXIMUM RESULTS from your workouts in the LEAST AMOUNT OF TIME. Imagine the value to you of being able to reduce your time in the gym by 50-70 percent! How to turn the CHORE of having to work out into the SELF-MOTIVATING REALIZATION that you have tapped into the MOST POWERFUL MEANS to meet your physical, mental, and emotional needs. How to REDUCE your risk of injury and safeguard against the very real potential of unexpected complications that even small injuries can lead to as we advance in age. How to INCREASE YOUR METABOLISM as a result of directly training to strengthen your body, and as a result kick your FAT-BURNING POTENTIAL into high gear. This is the biggest secret to maintaining a lean body! How to lock in YEARS OF EXTRA LIFE by performing a core set of muscle-enhancing exercises. These strength-training routines help REDUCE the odds that you will ever be afflicted by life-threatening diseases that are a direct result of your aging body losing physical strength and immunological protection. How to INCREASE YOUR CARDIOVASCULAR FUNCTION AND CARDIORESPIRATORY FITNESS. Remember how I harped on about the ineffectiveness of cardio routines to improve overall health? Well, if you want to build a strong healthy heart, these strength-training workouts will help you achieve that too! 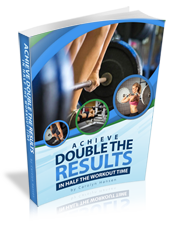 Not only will you receive full instruction on the BEST way to perform the individual movements in the small set of core exercises featured in the book, but you'll get 4 weeks worth of strength training and interval training workouts. But there is more to my program than the physical aspect alone. Nutrition plays a HUGE part in determining your overall health. It is often said that you cannot out-train a bad diet, and that is true. This is because when it comes to maintaining your body weight, what you EAT is more likely to affect whether you can attain your health and fitness ideals than what you do in the gym. Of course, when most people hear the world "minimalist" in connection with nutrition they instinctively equate the concept with "diet". A restriction in the number of calories they are permitted to eat in order to reach and maintain an ideal body weight. But minimalism in connection with nutrition means exactly the OPPOSITE. It has nothing to do with eating less, and everything to do with eating better. Instead of sticking to a minimum number of foods or calories, my goal is to have you learn the minimum number of guiding principles by which to decide what should go into your next meal. Imagine what it is like to stop fighting with your food conscience because you no longer have to deal with messy and confusing instructions about how to construct your meals and count the calories that go into them. None of my friends in the health and fitness industry have time or the mental energy to deal with that, and nor, most likely, do you. Your goal when it comes to deciding how best to deal with food is to find a plan that you can stick to for the long haul. A plan that does not undermine your efforts by increasing the odds that you will eat junk food to combat the stress of trying to stick to an "approved" list of foods. Let's face it, food restriction is torture. Any attempt to deny yourself simply dials up the urge to break from the narrow path and binge on exacly the kinds of food you SHOULD be avoiding. Long before I learned how to reinvent my approach to food I remember giving in to my cravings in spectacular fashion and having to live with both the shame and the guilt of knowing that I was a SLAVE to bouts of emotional eating. There might be nothing more soul-destroying than having your body betray you repeatedly by giving in to the urge to stray from your nutritional plan on an almost daily basis. So when you find that your minimalist philosophy CHANGES the way you think about food it can be enormously liberating. It is certainly important to keep hydrated throughout the day so that your body functions at peak capacity. But too often people will equate this task with drinking beverages that happen to be loaded with calories. Perhaps if this reduced the size of the next meal eaten it would not be such a problem. But this is rarely the case. So this ends up being a fantastic way to add "invisible calories" to your diet - calories you will not notice until they turn up on your bathroom scale as the weight of excess body fat. Soft drinks and fruit juices are a major culprit. But so are all of the cups of tea and coffee you sneak in over the course of the day if you are adding a sweetener to them. Likewise, watch out for alcoholic drinks at lunch or dinner. According to the USDA National Nutrient Database, you'll imbibe approximately 100 calories with every four-ounce glass of wine. Keep in mind that it only takes an excess of 100 calories each day to see your weight balloon by 10 pounds a year! Stick to water for hydration purposes if you can. The only beverages with calories that get my recommendation are those that are specifically DESIGNED to replace a meal - like the green smoothies I put on my breakfast table in the morning. These are a great way to get all the nutrients your body needs and are a terrific alternative to the usual breakfast options that most people wrongly assume to be good for them. By the time you have worked your way through the chapters of The Minimalist Nutrition Program you will know everything you need to know to begin making the RIGHT choices when it comes to putting food on your plate each day. No more fretting about which foods to buy and which to avoid. You will know EXACTLY what to do when meal time approaches because you will have the 10 Minimalist Nutrition Principles to guide you. You will have a philosophy of healthy eating to lean on from this day forward - the same one I have used for more than 30 years now. I know this program works. I know it because on those occasions when life has become complex and I have lost my focus and my health and my body has temporarily suffered for it I have ALWAYS been able to get back on track simply by remembering that I DO have a system that can be relied upon. And you can rely on it too. But, yes, there will be times for you - as there have been for me - when you lose your concentration. Times when if feels like your health and wellness are luxuries that will simply have to take second place in your life. Indeed for some people this is the norm rather than the exception. So to help with this problem I am throwing in a bonus book. This is a title that I have created specifically for dealing with state of mind. Depending on where you find yourself today, it may even turn out to be THE most powerful and valuable component of my program. When I sat down to create Mindset Mastery Secrets For Optimal Health it was with the realization that even though I can give my clients all the information they need to succeed with their health and wellness goals, many of them will simply never implement the plan. Not because they do not want to. Not always because life gets in the way. Often simply because the mind has a terrible affinity for resisting change. Even the potentially life-altering for the better kind of change. The reality is that most attempts to improve one's health fall apart because the person who wants to make the changes is not mentally prepared to succeed. No one ever ran a 4-minute mile without fully believing they could achieve the goal. No one climbs to the top of a mountain before first visualizing themself at the top taking in the view and relishing their accomplishment. And it is exactly the same with following up on your decision to implement a course of action for the better like the one outlined in The Minimalist Exercise And Nutrition Program. It will not happen just because you now possess the information needed to reclaim your health. You have to be FULLY INVESTED in the idea that success for you is INEVITABLE. There is simply no other possible outcome. Despite the fact that most of us are well aware that we need to THINK we can succeed before we can actually do it, it can be deceptively difficult to achieve this state of mind. For lots of reasons that only the psychologists fully understand, we are prone to self-sabotage. We literally condition ourselves for failure without even being aware of what we are doing. And with each failure to achieve what we set out to do it gets more and more difficult to break the pattern. This was certainly true for me. Despite doing everything for my body that I thought I needed to do to win, it was not until after I mastered the mind control techniques outlined in Mindset Mastery Secrets For Optimal Health that I actually won my first major bodybuilding title. For me, stepping onto the stage to compete in front of a live audience was terrifying. But with the mental devices I eventually mastered - devices which are covered in detail in the book - I was able to get past my limiting beliefs about my body. I have since applied these same powerful techniques of self-persuasion to pull off business deals and make inroads in other parts of my life where I would otherwise never have had the confidence to proceed. This is just ONE example of the kind of power you'll have at your fingertips when you have mastered the art of reprogramming your mind for success in ANY area of your life, including long-term health and wellness, which is the focus of The Minimalist Exercise And Nutrition Program. Correctly align your subconscious mind with your goal to achieve optimal health. You will learn to identify and remove any obstacles, negative attitudes, or mental barriers to long-term health and wellness. This is how you change your inherent resistance to staying the course into effortlessness. Substantially increase your level of motivation and commitment so that it becomes much EASIER to stick with your nutritional and exercise schedules. Reprogram your mind to ENJOY healthy foods. This is how you wean yourself off unhealthy foods without struggling to convince yourself of the necessity to do so. Reprogram your mind to ENJOY physical activity. Imagine what it would be like to find yourself addicted to a healthy pursuit. Wouldn't that make your life so much simpler? Forge a clearly-defined plan of action that will result in the achievement of the goals you have envisioned for yourself. Tap into the power of your inner self to make it EASY to say NO to foods you know will erode your health and disfigure your body. When you harness the POWER of your mind to work WITH you instead of against you, life becomes much easier, and your goals far more easily attained. Tap into INSPIRATION. This is truly the KEY to reconstructing your body, your life, and your whole SELF in a natural and lasting way. Deal with your emotions in POSITIVE rather than negative ways. Overcome your built-in resistance and laziness to take the steps needed to achieve long-term health and wellness. Markedly boost your self-confidence and self-esteem. Imagine how much EASIER it will be to accomplish anything you set your mind to when you are confident in your ability to make it happen before you've even taken the first step! Master your thoughts. You'll learn how thoughts can trigger emotions and influence your health. So when you have been shown how to deny these thoughts the ability to take control of your mind you'll regain the power to maintain absolute control over your future health. Learn to persuade your inner self rather than try to force your inner self to comply with the kinds of actions you know will assist your efforts to achieve the highest level of physical and mental wellness. Understand and appreciate why your mindset is critical to building a set of healthy lifestyle behaviours which can be practiced with ease for the long-term. Start powerful new habits that help to ensure long-lasting results, so that you NEVER find yourself back at square one. Learn how to enjoy the journey so that your long-term health and wellness endeavors are a reward in themselves, rather than just a means to an end. This is how you implement patterns of POSITIVE CHANGE that become a new way of life. How Much Does The Minimalist Exercise And Nutrition Program Actually Cost? Hopefully by now you have been able to see the extraordinary value that I have put into The Minimalist Exercise And Nutrition Program. The next part is up to you. I mean it when I say that this could be the LAST exercise and nutrition product you will ever buy. Imagine never again having to pay a dime to try to figure out what you should and should not be doing to put your body on the fast track for quality long term health. And the great thing is that with this program you are assured of doing the LEAST possible amount of work to secure those results! This is the kind of information that will ultimately save you thousands of dollars over the coming years as you will be able to rule out a wide variety of physical activities and nutritional schemes that are simply not necessary. That's Right - Only $37! Think about it: I wasted years of my life following exercise and nutritional strategies that were DOOMED to fail. If I had only known then what I have detailed in this program I would have saved myself a LOT of time, physical and mental discomfort, and MONEY by being able to avoid what doesn't work when it comes to achieving a superior level of health and fitness. There is absolutely NO reason that you should repeat my mistakes. P.S. Taking care of your physical needs does NOT have to be time-consuming, difficult to implement, or fraught with inefficiency. Not if you have a mentor to guide you - one that has already made every mistake there is to make so that you can avoid doing the same! Simply download your copy of The Minimalist Exercise And Nutrition Program right now for just $37.00. Then take a FULL 60 DAYS to read the product from cover to cover, and digest all of the information. That's how confident I am that The Minimalist Exercise And Nutrition Program is the answer you've been searching for. Don't wait another minute! Download The Minimalist Exercise And Nutrition Program and uncover the secret to implementing the most EFFICIENT and EFFECTIVE strategies to exercise and nutrition that you will ever come across. There simply is NO better approach to achieving long-term health and well-being than what I have to teach you in this course. I guarantee it! I understand I'll be instantly downloading The Minimalist Exercise And Nutrition Program ebooks, including Mindset Mastery Secrets For Optimal Health, for only $37.00 today, and today only. I hope that by now you recognise that this guide will be a valuable resource that never goes out of date and which will prove its worth over and over again. P.S. Remember that this is YOUR LIFE and your body we are talking about. Is it worth it to keep fighting with your health and weight issues by not investing in this information? P.P.S. You are protected by my 100% money back guarantee.